The first matchday of this season’s Champions League threw up a fixture worthy of the Champions League final. Last year’s finalists travelled to one of the most in-form clubs in the world. The match was fairly dull in the first hour, maybe to be expected with two teams that probably would have taken a 0-0 draw, however Kompany’s 57th minute goal was the catalyst for an entertaining last third of the match. City had Silva and Sterling returning to the starting line-up however Aguero was still deemed not fit enough to start, even though the Argentine came on as a substitute late on in the match. Juve had midfielders Khedira and Marchisio absent through injury and were hoping that they could use this fixture to turn around their dreadful start to the season. City were in a pretty standard 4-2-3-1 with Toure and Fernandinho acting more like no. 8s rather than a double 6, Silva roaming everywhere and full-backs Sagna and Kolarov waiting until the ball was high up the field to move into the final third. Juventus played in a 4-3-3 ish formation. Cuadrado was a conventional right winger however did often drop deep in the defensive phase in more of a wingback role. Hernanes was were Pirlo would have been last season, and Khedira would be if fit. He was important in first third build up however didn’t provide the penetrative in the opposition’s half that a more natural no. 6 would have. Morata played in an interesting Cavani-esque role. He played predominantly a left winger however was quick to join Mandzukic in the centre of the pitch in attack. 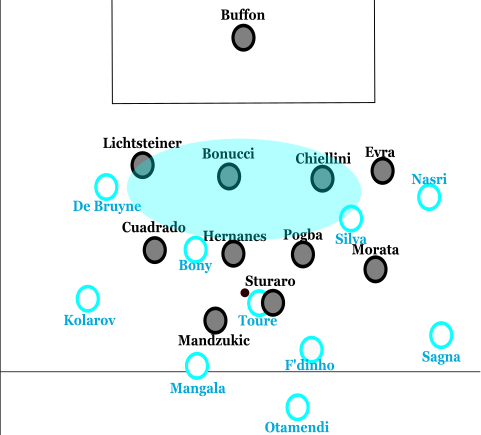 Juve were by no means Catennaccio however did defend well in a deep 4-5-1 shape, often with 11 men behind the ball. City did create chances however the quality of said chances wasn’t brilliant and there were systematic + technical issues, that I will come on to, combined with the personel issue of Bony (in my opinion) not being good enough to start as a lone forward up against Chiellini and Bonucci. Firstly, their passing intensity in the midfield was too slow. This is a disadvantage of having two central midfielders that are chosen for qualities other than their passing skills. City often should have been playing longer, quicker passes were instead they were being too laboured in possession and giving Juve’s very competent defensive block an easy ride. An example of City not being able to get it into space quickly enough. Above, we see Juve’s organised, compact, 4-5-1 occupying three of the five vertical columns on the pitch. It is clear that City need to get the ball to the opposite side of the field into Kompany, Nasri or Sagna. They do manage to get it to Nasri, but it takes them four passes and ten seconds–far too slow. 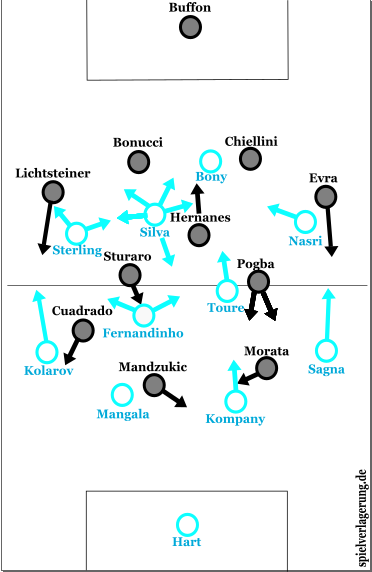 This slow circulation gives the Juve defence a chance to shuffle across and deny City any space on the opposite side. City’s second big problem in possession was the lack of support for Bony. City, in the past few seasons, have created thousands of chances and scored hundreds of goals playing with two forwards. I’m not saying they should go back to 4-4-2, but there is a problem with the isolation of Bony when you play David Silva at no. 10. Silva plays a roaming role and links up City’s play all over the field. Below is his touchmap in the game to show this. Silva plays this role brilliantly and is vitally important to City as I have mentioned however below is an example of where having two centre-forwards or a traditional no. 10 that plays off the striker would be more ideal. 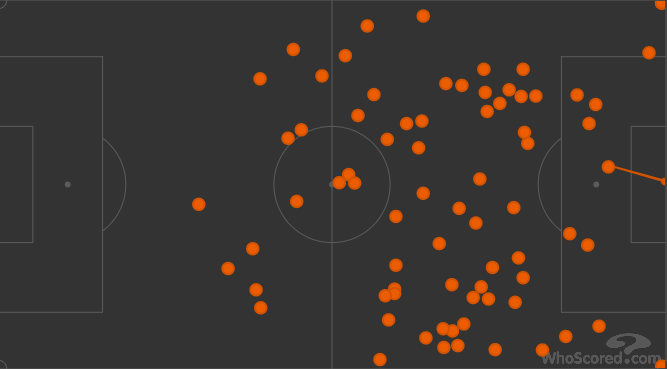 Bony turns and can play a through ball to…wait…nobody. Bony drops deep to receive. Toure has the ball in centre midfield. Bony has to drop about ten metres to receive the ball. Notice how either City winger is outside the full-back and Silva is in the right halfspace, rather than in the centre. Bony receives a pass from Toure and turns, having pulled Bonucci out of the back line. Bonucci vacating the back line leaves a huge space for a potential through ball to be played into however there is nobody on the shoulder of Chiellini or Lichsteiner to run into the space and have a good goal scoring opportunity. Also, the fullbacks pushing higher up would provide width and allow the wingers to move inside and be in more dangerous spaces. Above, Silva is helping City in possession in the middle third. He drops deep here to create overloads and be add some nouse on-the-ball in the middle third. 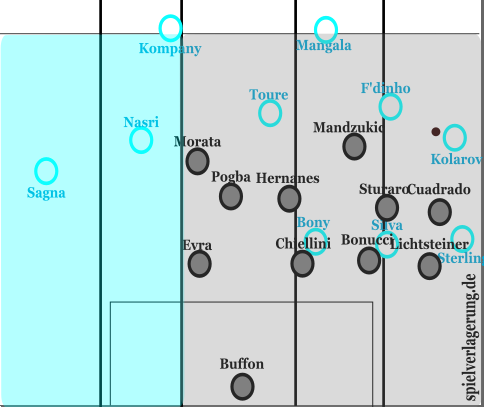 However, Fernandinho and Toure stay in this area and do not push up into a space in between Juve’s defensive lines. It is no good controlling possession in the middle third when there is nobody in the final third to create chances. As I have previously mentioned, Juve didn’t seem intent on dominating the ball nor committing too many men on the counter attack until they went 1-0 down. In fact, they didn’t register a shot on target until after Kompany put the hosts 1-0 up. Juve’s fullbacks contributed to the attacking phase as always and playing three attacking players in Mandzukic, Morata and Cuadrado could maybe be considered bold away to Manchester City however it was the attacking involvement of Juventus’ central midfielders which was disappointing. Pogba and Sturaro stayed deep for too long and had were not given as much freedom to get forward. City have an 8 vs 3 advantage. Bonucci looks to play a pass forward, Lichtsteiner moves up–however Sturaro covers Lichtsteiner instead of moving forward himself. Pogba has the ball in his own half and manages to play it away from pressure, into Bonucci. Juve now have a chance to push forward. Lichtsteiner does so however neither of Juve’s three central midfielders make bursting runs up the pitch. Sturaro moves back to cover the space Lichtsteiner has vacated. Morata, Cuadrado and Mandzukic have taken up pretty good positions however City’s defence still has control of the situation. Anybody that watches Manchester City regularly will notice that they always hold their defensive line on the 18-yard area line when the opposition have the ball in the final third (unless they are beyond this line). This does have its benefits of making defensive organisation easier however it was partly at fault for Juve’s equalising goal as Mandzukic knew he could stand anywhere along this line and not be played offside. He did so and was unmarked as Pogba crossed it into him from deep and he could finish to make it 1-1. 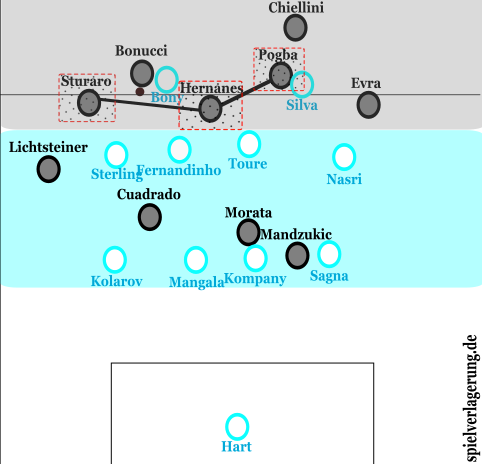 As I mentioned at the top of the analysis, Toure and Fernandinho play as no. 8s instead of no. 6s. Often lots of space is left behind them in defensive transition which made life difficult for Kompany and Mangala. Kompany often steps forward out of the defensive line well to deal with this. This problem is nothing new for City and not really worth looking at considering the positives the duo of Fernandinho and Toure provide. City pressed in a 4-4-2 shape which was man-orientated. This man-orientation meant it wasn’t very successful at times and Juve could play it out of the back with quick passing however would hit a wall at around the halfway line with the forwards picking it up with a defender tight to them. 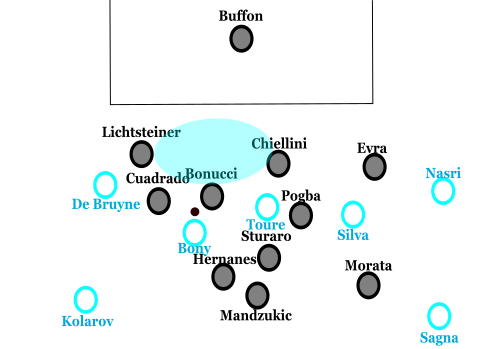 Also, the 4-4-2 shape wasn’t very effective when Bonucci and Chiellini spread while Hernanes moved into the space behind Silva and Bony to create a 3v2. However, surprisingly for a Premier League side, their pressing was effective at times and their man-orientation lead them to be very compact at times. A completely situational example of this man-orientation leading them to be very compact is below. Juventus will hope that they’re not doing a 2014/15 BVB by being dreadful in the league and great in the Champions League however this result showed why defensively, the Old Lady are still one of the best in the world. No matter what Manchester City do on Saturday and Sunday afternoons, they always seem to get a tough time of it in the Champions League. They showed how much they miss Sergio Aguero and cannot afford for him to pick up a more serious injury. City will still be expected to qualify with ease however with Unai Emery’s Sevilla side beating Gladbach 3-0, City cannot afford to be complacent. Only one thing. You mentioned that Khedira, if fit, would play the Pirlo-role. Do you really think so? Because I would consider him by no way as a deep-lying playmaker but as quite vertical box-to box midfielder. If the injuries are gone I think Allegri will play Marchisio in front of the the back four or back three like he mostly did last season when Pirlo did not play. Maybe you just meant Marchisio when you wrote Khedira 🙂 Or maybe Allegri and Khedira will prove me wrong. Anyway, besides that it´s a great analysis once again! I saw the transfer as a replacement for Pirlo in the no. 6 position, not the ‘Pirlo role’. Maybe I’m wrong and it seems likely that Marchisio will be first choice for that position. Also, it isn’t unlikely that once all of the midfielders are fit, Allegri could change the system to one which requires a double pivot-4-4-2/4-2-3-1/3-4-3/. Yes, this is also possible. It will be interesting to follow if and how Khedira will fit into this team.